One of the easiest and most versatile desserts you can make. This recipe is the perfect accompaniment to any Fall dinner party especially when made with Bigelow Vanilla Chai Tea. In a small bowl, add whole milk, sprinkle with gelatin and stir. Let sit for 5 minutes. 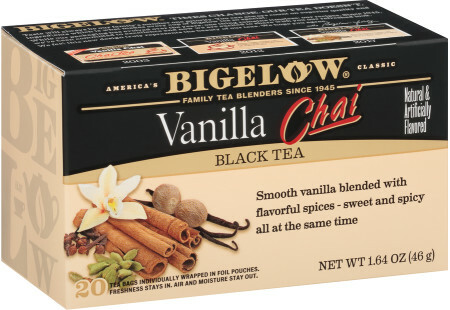 In a small saucepan heat water and ¼ cup of milk together with 2 Bigelow Vanilla Chai Tea Bags. Bring to a rolling boil and simmer for 4 minutes. Remove pan from heat and discard tea bags. Whisk in bloomed gelatin, remainder of milk, pumpkin, sugar, salt and one half of the whipping cream (½ cup). Taste and adjust salt if necessary. By this time, the chai mixture will have cooled a bit. Strain it through a fine mesh strainer into a bowl, pushing down on the solids. Scrape the underside of the strainer to get all of the pumpkin goodness into the bowl. Whip the last ½ cup of heavy cream to barely soft peaks. Whisk and fold into chai mixture. Pour into decorative tea cups or small ramekins and chill until set, at least 3 hours. Garnish with a few gratings of fresh nutmeg. May we suggest Vanilla Caramel Tea - Case of 6 boxes - total of 120 teabags to pair with this recipe?